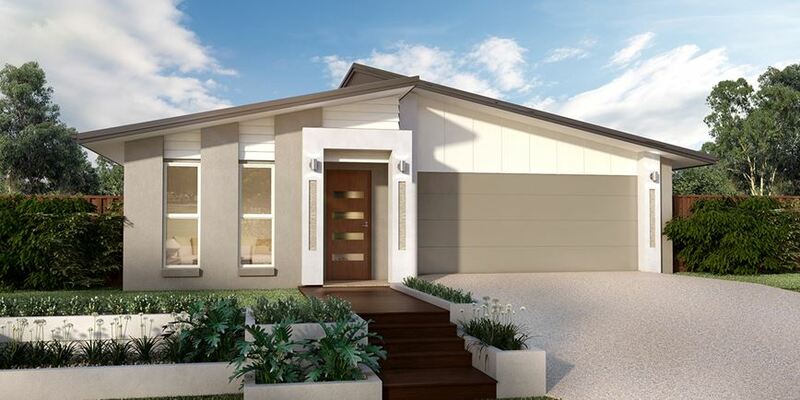 Luna Pimpama is an 87-lot development located in Pimpama on the Gold Coast. Situated next to some of the best amenities in the area (the Pimpama Junction Shopping Centre is just next door! ), Luna is ideal for families and investors. The estate has clearly been developed with these groups in mind, as it includes three small parks, and the new houses for sale all have extra storage spaces and double garages. In essence, Luna was made to be liveable for whichever type of homeowner buys into it. 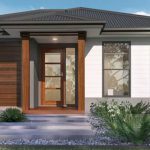 Luna Pimpama is now selling new land in Stage Three of the project, with the first two stages having completely sold out. All of the house designs are three or four bedrooms, and land lots range in size from 380 – 653 sqm. Buyers are protected by a covenant to ensure that a high standard is maintained throughout the community for owner-occupiers and investors alike. 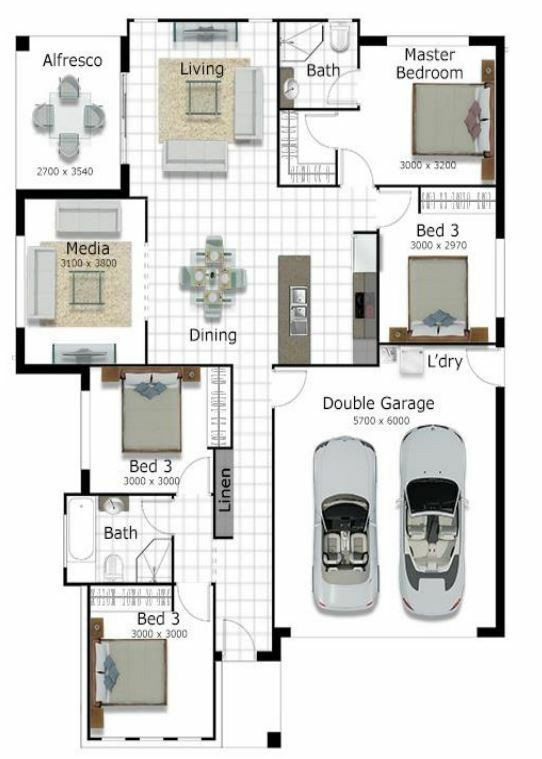 Lots range in size from 380 sqm to 653 sqm. The new house designs are all either three or four bedroom. 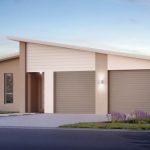 Prices at Luna Pimpama start at $474,000. Luna Pimpama consists of 87 lots, and is currently under construction. The brand-new three and four-bedroom houses for sale all sit on lots that range in size from 380 to 653 sqm. One thing that sets Luna apart from other similar developments is its walkability. 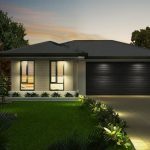 Due to its location, Luna is only minutes away from the Pimpama Junction Shopping Centre, and less than half an hours walk away from both Pimpama State Primary College and Pimpama State Secondary College. All of the houses are full turnkey, which is ideal for buyers who want to move into their home with it ready to go. There are three small allocations of parkland in the estate itself, as you can see in the master plan below, but Luna is also minutes away from other local parklands, so these spaces are for relaxation, or to take your toddler to burn off some energy quickly. 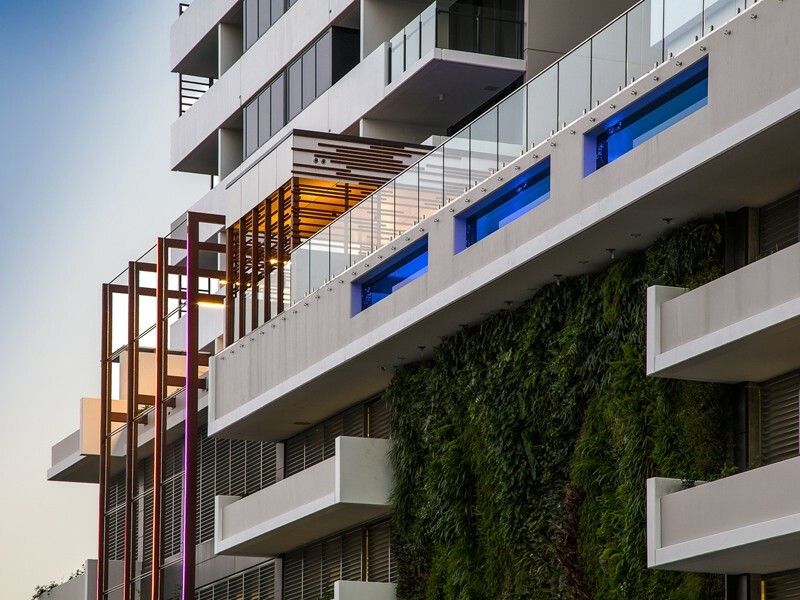 Ivy & EveCompleted in 2018, these South Brisbane apartments are ready to move into today! Prices start at $474,000 to $797,000, which makes Luna ideal for both first-home buyers and young professionals — as well as investors who want to capture these rental groups. The walkability of the location — most places can be easily accessed on foot, which is great for those who want to get in a little extra exercise or enjoy walking. The estate layout is great, with every house being less than a few minutes away from a park, and the estate itself being easy to navigate. Pimpama is still undergoing a massive amount of development, so expect some noise and road closures throughout the next few years. Traffic can be difficult to navigate during peak hours due to their being only one major road in and out of Pimpama, the M1. The display suite for Luna Pimpama is open by appointment at the moment, with a new display set to open in the coming weeks. Luna Pimpama is located at 250 Yawalpah Road, Pimpama, which places it adjacent to some of the best and most used amenities in the area. Access to the site is through Soldier Bird Avenue. One side of the estate sits adjacent to the Pimpama Junction Shopping Village, which includes a Woolworths, dentist, bakery, salon, cafes, and restaurants. There are service stations on either side of the Yawalpah Road-Dixon Drive intersection, and an auto shop. Dixon Reserve, a large local parkland, is just down the road, and the Gainsborough Greens Golf Course is only four minutes away. Pimpama State Primary College is a five-minute drive (or 25-minute walk) away from Luna, as is Pimpama State Secondary College. 2015 was the first year of operation for Pimpama State Primary College, so everything is brand new on the campus. There are nearly 900 students attending the school, as of Term 1, 2019. Pimpama State Secondary College is well-known in the area for the emphasis it puts on teaching its students digital literacy, how to be effective communicators, and how to be a 21st-century learner so that they can easily step into the world upon graduation. Traffic can be a problem in Pimpama, as a crash on the M1 — which is the quickest way in and out of the suburb — can put cars at a standstill for quite a while. This is slowly improving, but it is something to watch out for when you’re heading to work in the mornings. To know more about Pimpama, read our suburb review here. 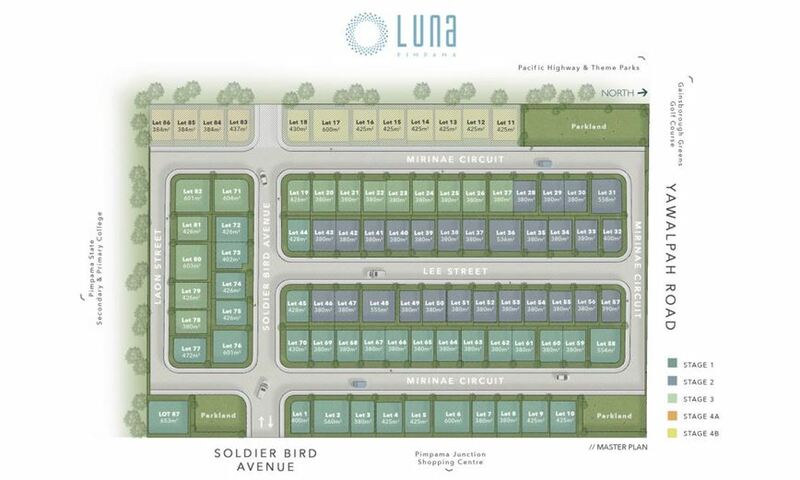 All of the lots at Luna range between 380 and 653 sqm. Every lot of land for sale at Luna Pimpama has been registered and is ready to build on, meaning it is just a matter of picking the lot you want to get things started. All of the homes have fairly standard exteriors, but all are designed to endure the Queensland weather and look good whilst doing so. They all come in neutral colour schemes, which allows the architectural designs of the homes to really stand out. All of the homes are single storey. As you can see in the floor plans below, all of the houses have either three or four bedrooms, making them ideal for families. The master bedrooms have an ensuite bathroom and walk-in-wardrobe, whilst the other bedrooms share the second bathroom. 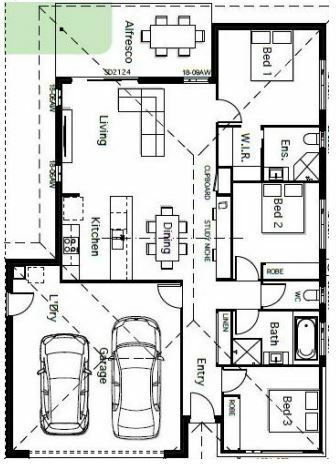 All of the house floor plans indicate that they have double garages, which is always a nice touch. The kitchen, dining and living areas are also all open-plan, which is ideal in Queensland due to the sunny nature of the weather here. All of the homes have their own laundry and a study nook. 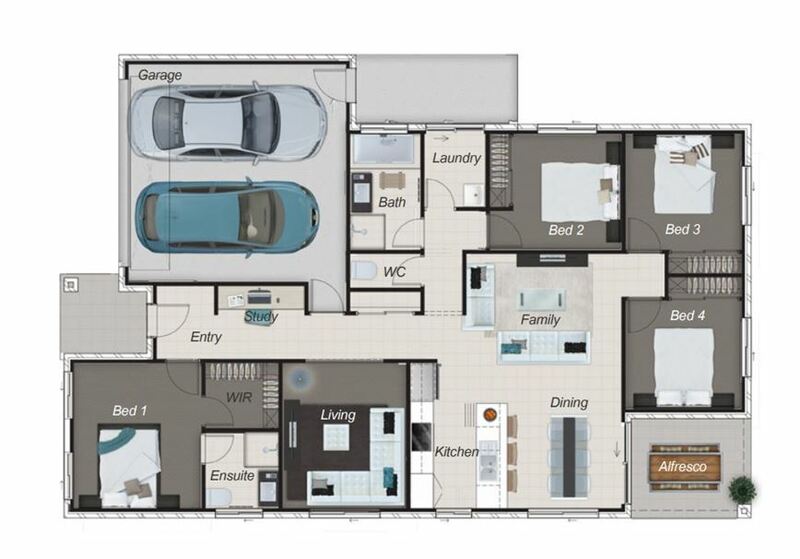 Some house designs, as with the example floor plan of Lot 32, have a second, separate living/media room, which could potentially be used as a play room for kids, or a larger study for young professionals. 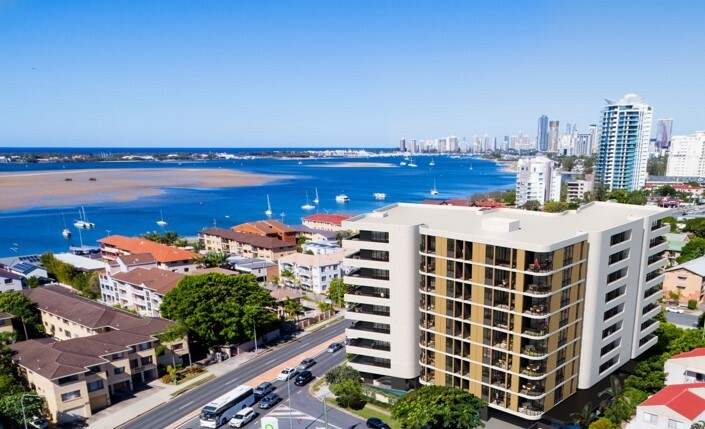 Luna is located in Pimpama, a suburb on the Gold Coast that is well-known for the large amounts of investment properties and renters in it, due to it being considered a ‘property hotspot’ for the last several years. 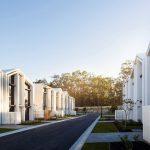 Over the last few years, Pimpama has experienced some change — especially with the introduction of Gainsborough Greens — and now most renters are young professionals and families as development in the area slows down. Rent is, on average, $430 per week for houses, with investors getting a gross rental yield of 4.61%. 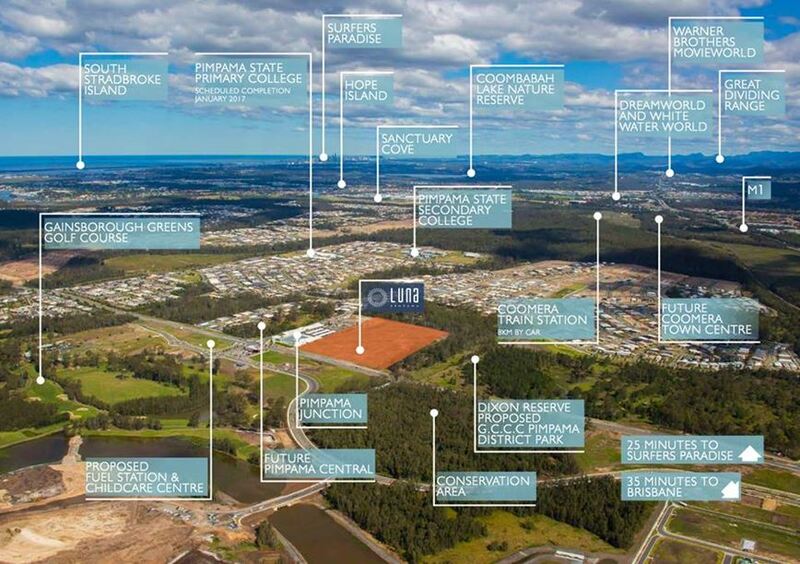 There are quite a few developments currently being sold in or around Pimpama. This includes Gainsborough Greens, which has lots that range in size from 375 to 1,046 sqm. 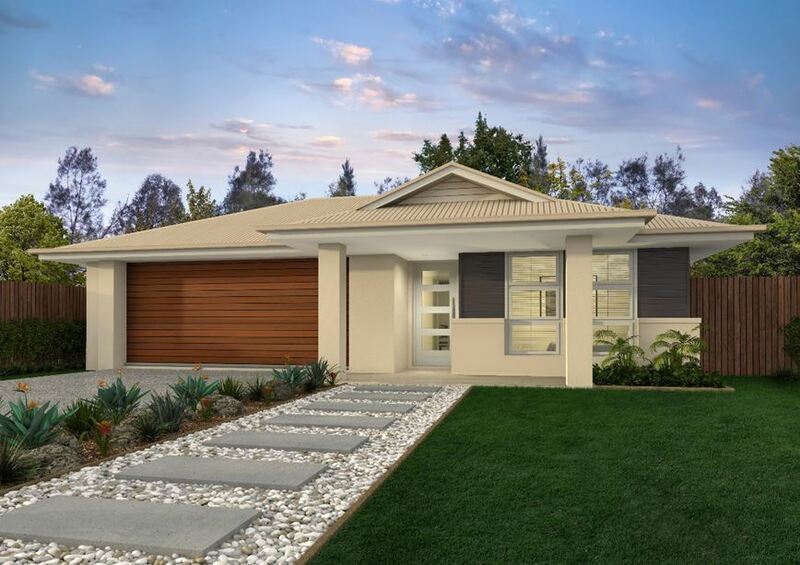 There is also Manor Park Estate, which is located within ten minutes of the Coomera Town Centre development precinct and train station, and Pimpama Village, a family-oriented development located on the old Coulters Farm. The Heights is another option, and it has both house and land packages and new townhouses for sale. Luna is being developed by APDC Heritage, a fairly new property developer. Founded in 2014, APDC creates developments that are underpinned by the idea of livability and getting residents to spend time together.